In 2010, the world reached its target for Millennium Development Goal 1 (MDG 1) five years ahead of schedule. 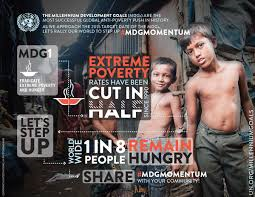 MDG 1 aimed to halve by 2015 the proportion of people living in extreme poverty and hunger at the global level. According to the MDG Report 2013, many developing countries have reached their respective goals. Bangladesh is one of the 38 countries on this list. MDG 1 uses the dollar-a-day standard (PPP) to measure extreme poverty, targeting those who survive on less than $1.25 per day. According to Bangladesh’s MDG Progress Report 2011, the percentage of the population living below this standard fell from 68.8 percent in 1992 to 49.6 percent in 2005. The proportion living below the country’s own national poverty line of 2,122 kcal food consumption declined from 56.6 percent in 1992 to 31.5 percent in 2010. However, these numbers may well be overrating Bangladesh’s success. They divert attention from a simultaneous increase in income inequality. The share of the poorest quintile in Bangladesh’s national income decreased from 6.5 percent in 1992 to 5.5 percent in 2010.The actual number of people living below the $1.25 poverty line has also increased from 40 million in 1981 to 77 million in 2005. Are the MDG poverty measurements misleading? Have antipoverty programs left certain groups behind? Poverty measurement is an important, but somewhat overlooked problem in the development world. Measurement criteria determine to whom policies and programs target their services. Also, extreme poverty programs tend to be expensive. As many of these families suffer from complex challenges and vulnerabilities, they require comprehensive support packages and constant monitoring. Inappropriate measurement strategies lead to mistargeting, which not only deprives the poorest families, it also leads to a tremendous waste of program resources. Poverty measurements for the MDG specifically suffer from two problems, that of universality and linearity. International poverty lines such as the dollar-a-day standard ease cross-national comparison. This universal measure allows researchers to compare the achievements of countries that are both institutionally diverse and geographically distant from each other. However, these very contextual differences also challenge the utility of a universal poverty line in accurately measuring poverty within a particular country. For example, differences in prices and inflation affect how far $1.25 would stretch for families in different circumstances and over time. In Bangladesh, the Bangladesh Bureau for Statistics (BBS) initially drew two poverty lines based on caloric intake, at 1,805 calories and 1600 calories, which reflected the 85 percent and 75 percent of the absolute poverty line of 2,122 calories. However, Bangladesh’s national poverty line underestimates the actual level of poverty in two ways. In addition to hunger, poor households also suffer from chronic malnutrition. Therefore, BBS later implemented the Cost of Basic Needs (CBN) approach, which considers the quality of food intake and measures extreme poverty based on a necessary food basket of 11 items per household member. The MDGs measure extreme poverty by the former and not the latter. In Bangladesh, national poverty lines also suffer from the problem of linearity; they assume that poverty is one-dimensional and derives from income-deprivation alone. However, poverty is multidimensional; it encompasses temporal and structural components. On the temporal front, a family’s poverty status can vary over time. Therefore, linear classifications erroneously identify these families as poor at one time and not at another. Many of Bangladesh’s poorest families suffer from chronic poverty, a long-term, often inter-generational form of poverty that Hulme and Shepherd identify as lasting for five years or more. These households may slide in and out of extreme poverty based on their attempts to overcome their conditions. Therefore, they fall into the extreme poverty bracket at certain times, but not at others. Linear poverty lines cannot capture poverty’s dynamic nature; therefore, they risk overlooking the chronic poor. Poverty also encompasses a structural dimension. Extreme poverty is not only a problem of income; it is also a problem of access. The extreme poor lack access to many basic needs, including shelter, nutritious food, safe drinking water, sanitation, regular employment, health care, and education. During illness or emergencies, they have no access to health care. Many cannot seek or maintain regular employment due to ill-health or insufficient skills. They lack the capital and market access for entrepreneurial activities. These multiple vulnerabilities set the extreme poor aside from other groups. Geof Wood argues that the more dimensions that deprive an individual, the lower their likelihood to escape poverty. In Bangladesh, the geographically marginalized lack access to capital and markets. Families from the southern coastal belts have trouble maintaining productive assets and growing food due to sea-level rise, natural calamities, and residual saline waters. Disabled and elderly populations often cannot engage in any income generating activity. Orphans and distressed children often suffer from psychological issues and access to basic schooling; many of these children end up on the streets. Each sub group of the extreme poor faced different structural problems. Therefore, accurate identification of the poorest groups would require that studies identify the factors that put certain families in the corner of the market – that is, their specific disadvantage. For example, what skills and resources did they possess? What structural constraints did they face? For example, was the problem logistical? Were they disabled? Were they located in a char without regular market access? Did they lack the education and skills for successful entrepreneurship? Poverty measurements also determine whom anti-poverty programs identify as their program beneficiaries. In Bangladesh, multiple poverty lines pose an additional problem of overlapping program identification criteria. Some development organizations had started to use structural measures to identify program beneficiaries. For example, the Targeting Ultra Poverty program of the development organization Brac uses a number of inclusion and exclusion criteria to identify participating households, such as ownership of less than 10 decimals of land, lack of productive assets, non-school going children and the absence of an active male member in the households, among others. However, different organizations used their own definitions and classifications for poverty. A study by the NGO BRAC found that many mid-level program staff identified extreme poverty based on their particular organization’s definitions, often based on the organization’s targeting methods for their own product. These structural factors can help create a new poverty measurement standard for Bangladesh. However, that would require lengthy and expensive research on the efficiency of these targeting methods. Development practitioners would rather spend these funds on actual programming purposes. On the one hand, Bangladesh’s accomplishment in extreme poverty reduction deserves applause. However, the fact still remains that existing empirical data may obfuscate the exact degree of this achievement. Because measurement standards also affect the targeting practices of programs, such mis-measurement may also hamper poverty reduction in the long run. Even by existing national poverty lines, over 30 percent of the population still suffers from hunger and malnutrition. Designing appropriate and relevant poverty measures is instrumental to identifying those left behind and addressing their vulnerabilities. Is Bangladesh on the Right Path? As the target year for achieving the Millennium Development Goals (MGDs) draws closer, the international community has been reflecting on the development successes and failures of the past decades. [i] When it comes to poverty reduction, countries that can be labeled as success cases have followed one of two paths. Some owe their success to economic growth; others to social protection for the most vulnerable. Laurence Chandy distinguishes between these competing views in an opinion piece – “One focuses on unlocking the potential for rapid and broad-based development through the economic transformation of poor-countries; the other advocates the establishment of a global social safety net.” A recent World Bank study finds that Bangladesh owes its poverty-reduction success to the former. The international community has applauded Bangladesh as an MDG success story. [ii] And despite heavy national investment in service-related programming, Bangladesh has reduced poverty with the help of the service sector, and not the welfare system. The study identifies proximate causes of poverty reduction in sixteen countries that achieved success in the area. It finds that labor income was the most important contributor to changes in moderate poverty for most countries. At the same time, non labor incomes, including cash transfers, became more important for the extreme poor, those living farthest from the poverty line. This does not apply to Bangladesh, where surprisingly, labor income played a stronger role. This piece explores why Bangladesh has taken this route out of poverty. Bangladesh has implemented a neoliberal, aid-oriented development strategy since the 1990s. The government has pursued a diverse programmatic agenda with heavy donor investment, especially in the form of World Bank/IMF loans. While official development assistance remained fairly consistent over the past decades, net loans increased from $1.3 billion in 1982 to $9.3 billion in 2007. A snapshot of World Bank projects in Bangladesh suggests that most of these funds were used for actual development programming. Both the government and non-government organizations implemented these programs. In fact, NGOs have gradually emerged as the government’s key development partner, often replacing the former in many areas. The country has simultaneously experienced a growing economy. According to the World Bank’s World Development Indicators, GDP grew by 6.7 percent in 2011 (compared to India at 6.3 percent, Indonesia at 6.5 percent, and Maldives at 7 percent for the same year). This growth is inextricably linked to the informal service sector, especially, the ready-made garments (RMG), housing, and agricultural industries. Rapid urbanization has created sprawling cities and small towns are expanding from their centers. Across the country, the urban-rural divide is now increasingly blurred. A growing need for human resources draws village-dwellers into the cities and small towns in an urban diaspora. Others continue to work in a growing agricultural sector that is heavily dependent on agricultural loans and subsidies. The World Bank study implies that this informal sector has had the most significant effect on poverty reduction. In contrast, the recent surge in welfare programming – cash transfers, asset-transfer programs, and various forms of food aid – has had little effect. This link between economic growth and poverty reduction makes Bangladesh an outlier. Its development trajectory undoubtedly challenges the skepticism surrounding the distributive or trickle-down effect of economic growth. It seems to imply that economic growth can give rise to a noticeable working class. However, Bangladesh’s story is not so simple. The country’s largely informal service-sector hires workers based on daily contracts, without benefits or the guarantee of future employment. Of late, safety violations in the RMG industry have brought Bangladesh into international headlines. The fact that Bangladesh owes its poverty eradication to labor income as opposed to non-labor income may also create the misperception that the country has chosen a certain pathway out of poverty. It may not necessarily be the case that countries are likely to pursue one path over another. In fact, Bangladesh has pursued both paths to poverty reduction – the neoliberal growth model and elaborate social protection schemes. However, economic growth has simply worked better than social protection. The World Bank study finds that non-labor income has helped the extreme poor in countries that have revamped their social welfare system. Bangladesh is not on this list. Both findings are disconcerting. Each of the two paths caters to a different sub-group of the poor; thus, impoverished groups that are most likely to gain from labor-income are more likely to cross the poverty line as those who would have benefitted from social protection are increasingly left behind. The labor sector ideally draws skilled workers. The poorest in society lack the skills and education to pursue these opportunities; they also suffer from chronic malnutrition and ill-health that make regular employment difficult. It is this latter group that Bangladesh’s social protection system was intended to assist. So, what went wrong? First, Bangladesh has yet to develop an informed, well-designed strategy that targets the very poorest. Since time immemorial, the government has adopted a “charitable” approach to the extreme poor. Social protection provide a safety net for families undergoing income shocks without a longer-term plan for their rehabilitation into social and economic life. These groups do not benefit from mainstream poverty programming. They are “high-risk” candidates for microfinance and agricultural loans and also lack the collateral for credit. Bangladesh wholly adopted the World Bank’s neoliberal model in the late 1990s. The Bank’s development strategy, outlined in the Poverty Reduction Strategy Papers (PRSPs), identified an elaborate scheme for the extreme poor that never developed into a coherent programmatic agenda involving all major stakeholders. [iii] Targeted programs are also expensive. As a result, policymakers are divided in their views regarding the best use of government funds – targeted programs for a few versus large-scale programs for the majority (see Brac study here). Existing national strategies also suffer from a crisis of relevance. Any development strategy must be driven by the reality on the ground and draw on the combined knowledge of various groups in society. In Bangladesh, the need to follow donor agendas has left many national stakeholders out of the decision-making process. According to the Brac study, the PRSP drafting process left out the voices of many groups. Rather, it was designed by “civil society” – in Bangladesh, this refers to an elite group of research institutions, government officials, and donor representatives. The second problem is one of service allocation. At the local level, elected local government representatives select program beneficiaries based on specific selection criteria. However, given the large number of potential recipients, the demand for services often outweighs their supply. It is not unusual for service distributors to choose recipients based on personal preferences, family ties, or party-based patronage. Many of these programs involve food aid, and also suffer from leakages at various levels. In the end, many needy families receive no welfare goods. A Brac study finds that 70.35 percent of very poor families received any form of government service compared to 39 percent of rich families; the latter should not have received any welfare services at all. This crisis is further intensified by the fact that beyond credit, few mainstream poverty programs exist for all categories of the poor. Since safety nets are the only benefits being distributed, they become coveted resources. Some donor organizations have adopted holistic and creative programs for the poorest groups. MFIs such as the Grameen Bank and the government-run Polli Karma-Shahayak Foundation implement microfinance-plus programs that bundle credit with a range of services such as health, training, and stipends. Others combine social protection benefits with a productive asset, such as a cow or chickens, to help extreme poor families sustain themselves and build an asset base at the same time. The production of stipends reduces the risk of families selling their asset for household maintenance. However, asset-transfer programs are expensive and need rigorous oversight. The Brac study reports, successful programs require their recipients to overcome their hopelessness and develop and entrepreneurial mindset. The Chars Livelihoods Programme, which operates in remote chars or river-islands, attributes its success to large support packages and close supervision. Brac’s Targeting the Ultra Poor program employs a rigorous targeting method. Because these programs are expensive, they are not sustainable. Extensive as they are, they do not provide universal coverage. NGOs are unlikely to implement these programs on a national scale without the government’s partnership. The link between labor income and poverty reduction – as well as the failure of social protection — has two implications for Bangladesh. It highlights the need to expand and formalize the service sector. Bangladesh’s RMG sector has recently undergone international scrutiny due to a number of disasters – factory fires, and a tragic building collapse that claimed over 1,100 lives. Pressure from the international community has driven numerous retailers to withdraw their business from Bangladesh. The RMG business is essential to the country’s economy, and as we now know, poverty reduction. Advocacy groups must demand that manufacturers step up safety standards and the government holds factory owners accountable. There is also a dire need to adopt a comprehensive extreme-poverty agenda involving all stakeholders. Without such an initiative, Bangladesh’s poverty reduction rate will likely be unsustainable. As of now, labor-oriented growth may have lifted the more skilled workers out of poverty. However, those remaining behind suffer from multiple and complex vulnerabilities; they are the hardest to help. Without a holistic programmatic agenda, poverty reduction rates are likely to stagnate once other groups have crossed the poverty line. This phenomenon is not unique to Bangladesh. A study by the Brookings Institution finds that global poverty reduction rates may not be sustainable as the poorest may not make enough progress to escape poverty in the next twenty years. When it comes to the way forward, countries need not follow one path or another. A recent article in the Economist argues that economic vulnerabilities are more easily overcome than social vulnerabilities, for example, the lack of health-care, education, and good governance. However, economic and social vulnerabilities are not separate and separable – rather, they are intertwined. Bangladesh has shown that some social vulnerabilities are more easily overcome than others. The country has made remarkable progress on primary education, fertility-rates, and infant mortality-rates. A distinction based on the type of vulnerability is essentially superficial. Those who are the most vulnerable suffer from multiple and overlapping shocks. Policies must, therefore, identify the most vulnerable. They are the neglected ones. And whether in Bangladesh, or elsewhere, we must leave no one behind. This article was originally published in Foreign Policy Blogs of the Foreign Policy Association. Nayma Qayum is an Adjunct Assistant Professor in Political Science at Pace University, New York, and a member of the Alalodulal editorial board. [i] MDG 1 aims to halve by 2015, the proportion of people living in extreme poverty and hunger in the world. [iii] The World Bank-prescribed Poverty Reduction Strategy Papers adopted an elaborate scheme to help citizens cope with income shocks – safety nets, social solidarity, risk insurance such as credit in times of crisis, public health, and disaster prevention and mitigation.